It was common for companies, such as Shell and British Transport Film , to produce industrial cine-magazines, and one of the earliest and long-lasting productions for the National Coal Board was Mining Review. 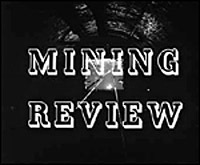 Taking its cue from the popular cine-magazines of the 1930s and '40s, such as Pathé Pictorial and Eve's Film Reviews , Mining Review offered a monthly look at various mining-related issues. Re-named Review in September 1972, it was an enormous success and its production lasted nearly until the demise of the NCB Film Unit in April 1984. At its height, the series was watched by 12 million people and distributed to over 700 cinemas nationwide (mainly in mining areas); over 420 editions were produced, the last being 36th Year No. 5 in March 1983. It covered mining in its widest sense, often looking at the social activities of miners, including women billiard players and pigeon-fancying, and charting improvements in miners' lives, such as the health centres, as well as covering the drive for increased pit production and mechanisation. With four or five items per issue, the editing was punchy, with a lot of information conveyed in a short time. According to the Unit's founder, Donald Alexander , production practically ran itself. There was a weekly editorial meeting with representatives from the NCB, the National Union of Mineworkers, Data (as the producing company) and the NCB Film Officer. Stories were gleaned from NCB social clubs, press cuttings, suggestions from the editorial committee and regional press officers. Mining Review echoes the development of the NCB film productions. The series was initially made by the Crown Film Unit, under the auspices of the Central Office of Information (a common practise for government-run agencies). Data Film Productions took over production after the sixth issue. The NCB Film Unit took control in 1963, continuing until the last issue.